Curious about Tesla owner demographics, including Model S and Model X owners? Read on! The average household income of a Tesla Model S owner is a little higher, at $153,313. There are other online sources of Tesla owner demographics including this one at market research company Quantcast that reports owners have income over $100K. 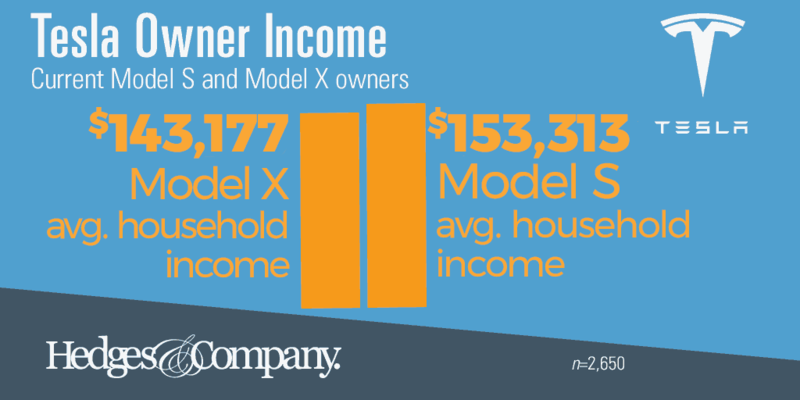 There’s also this survey from Teslarati that puts Model X and Model S owner income significantly higher. Note that geography matters with vehicle ownership and “average household income.” The average luxury car owner has an average income of around $100,000 (2014), but many Tesla owners are in California where the cost of living is higher than average. When Kantar Media TGI studied luxury car owners for the New York Times, the average income was about $100,000, but that average ranged from $83,891 to $155,548, by state! This data is pulled from a total universe of 2,650 Tesla owners with a margin of error of +/-2.5%. Tesla owners are an older demographic. Our data shows that the median age of a Tesla Model S and Model X owner is just under 54 years old, compared to 38 for the US population. 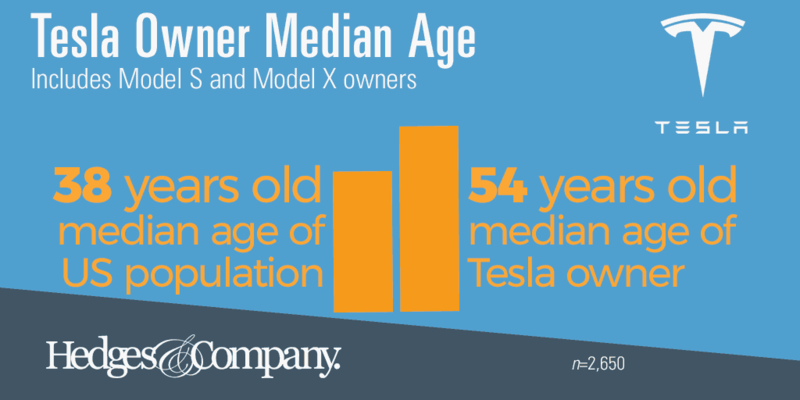 The median age of a Model X owner is 52 years old and the median age of a Model S owner is 54. These numbers line right up with the Teslarati survey. Our margin of error is +/-2.5%. We looked at the gender of current Tesla owners, including Model S and Model X. 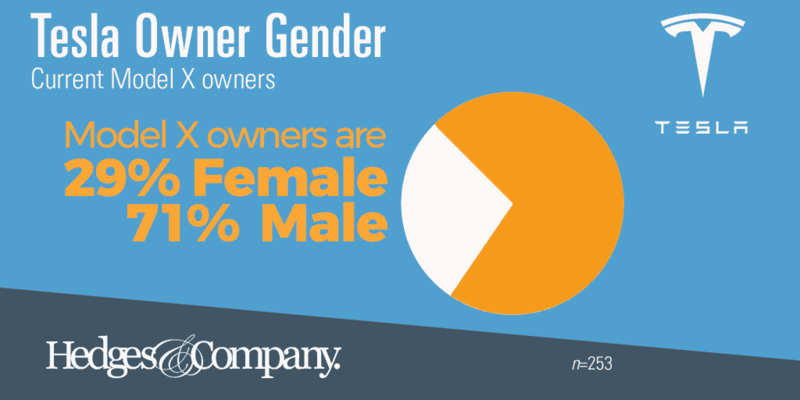 Owners of the Model X have a higher percentage of women owners. Women own 29% of Model X vehicles and men own 71%. The Model X is a gull-wing SUV (according to Tesla) or CUV (according to many in the automotive industry). 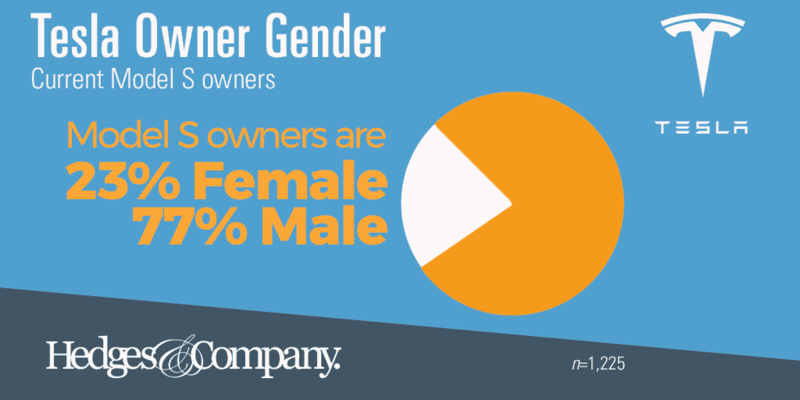 A higher percentage of women makes sense since many CUVs tend to have a higher percentage of women owners. The Tesla Model S, a four-door sedan, tends to have more male ownership than the Model X. Males own 77% of Model S vehicles and women own 23%. Our numbers are based on a universe of 253 Tesla Model X owners and 1,225 Tesla Model S owners. We’re very curious when more Model 3 data becomes available, how that gender breakdown will look. We hope to report Model 3 demographics in 2019. There’s a comparison of male/female ownership of Tesla along with popular SUVs and CUVs over at Teslarati. Due to the high household income and older age of Tesla owners, this should not be too much of a surprise. 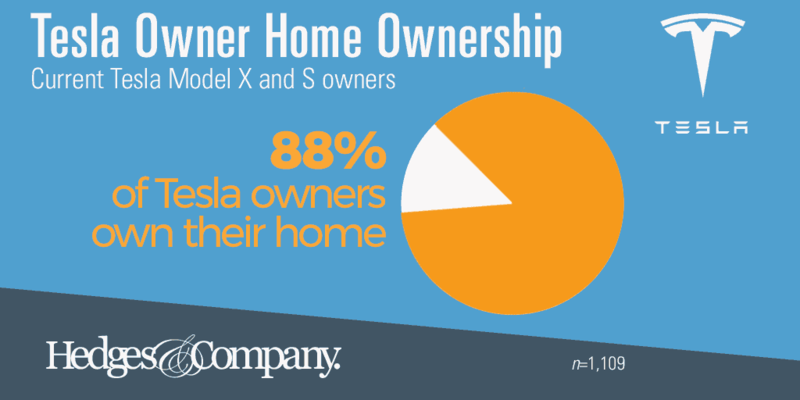 88% of current Tesla owners own their own home. That leaves only 12% of Tesla owners as home renters. 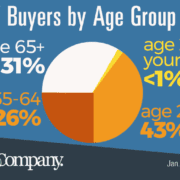 As a comparison, the percentage of Americans who own their own home has fluctuated between about 64% to 67% in recent years. That puts Tesla owners a full 21 to 24 points higher for home ownership than the general population. The median value of a Tesla owner’s home is $348,167. Since many Tesla owners are in areas where real estate values are high (California, for instance), that number is naturally skewed higher. Still, it’s obvious the Tesla owner tends to be well-off. Tesla owners tend to not have children in the home. 66% of all current Tesla owners don’t have any children in the home, vs. 34% who do have children in the home. The ethnicity of Tesla owners skews toward Caucasians, at 87%. Owners who identify with Hispanic ethnicity make up 8% of Tesla owners, leaving 5% to other ethnicities. Where are the Tesla Model 3 demographics? 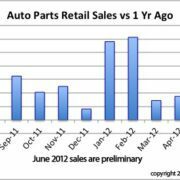 You may have noticed Tesla Model 3 demographics are missing from this analysis! The Model 3 started shipping in the second half of 2018 and the model is too new for us to have enough data to publish reliable, accurate numbers. UPDATE: Model 3 demographics are now available, click here. People interested in buying a Model 3 are younger than other Tesla owners according to Quantcast. 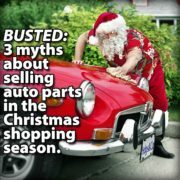 This data comes from the master vehicle owner database of 175+ million vehicle owners, including large amounts of consumer-level data, which is overlaid on vehicle records. This gives us a great deal of accuracy when we pull and analyze demographic data, without having survey errors from self-reported data or other types of “sampling errors.” Most of the statistics cited on this analysis have a margin of error of +/-2.5% at a 95% confidence level. 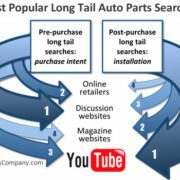 Do you need to reach Tesla owners with a postal mailing list? 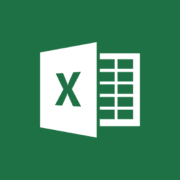 We can help you with that, just give our office a call or click on this button below to fill out a simple form.